Description: The prospects for the production of unmanned aerial vehicles leading countries, development trends and problematic issues of improving the navigational systems of modern unmanned aerial vehicles. The necessity of a functional, information and association navigation hardware meters different physical fields in an integrated navigation system. Kashaiev, I.O. and Smyk, S.I. 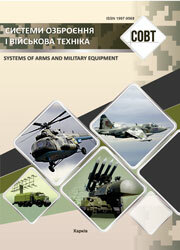 (2015), “Tendentsii rozvytku system navihatsii bezpilotnykh letalnykh aparativ” [Trends in the development of navigation systems, unmanned aerial vehicles], Systems of Arms and Military Equipment, No. 4(44), pp. 77-79.